Are you looking for best Garrett metal detectors review? If you then we have refined 6 best Garrett metal detector according to your type of hunting and budget. Garrett is an extremely popular brand in metal detector industry. That's why a vast number of hunters are satisfied with their machines. Here, we not only give you 6 Garrett metal detector review but also compare each of this item for you. So that you need not to have to face any difficulties to choose the best detector according to your test, before starting the reviews, let's know about the Garrett Company. Garrett Metal Detectors is the biggest detector brand in the industry, with a track record for being the worldwide leader for years. The company serves both the professional and consumer markets by providing every necessary product and accessory for the precise detection of metal. They began their journey back in 1964, and over time found their stride for making the best position and security metal detector on the market worldwide. Charles Lewis Garrett was the founder of the Garrett until his passing in 2015. Ever since the original Dual-Search Coil Hunter in 1964, the company has improved on its functions and design so that precision was a top priority. That's why the older model from Garret still valuable to the consumer. Since they do not suffer from a decline in quality, the older machines from Garrett are just as great as the latest models. The best thing about the Garrett is their affordable price range. Garrett Company covers all price ranges, and the majority of their products on the consumer level are midrange or lower level. The most expensive detectors from their line are of severe users or professional level users. So, there are numbers of options to choose your ultimate detector. This company always impress with their designs. A sporty look has been used on ACE series. The ACE Series all detectors are extremely joyful to the customers. They never compromise with their products design that's why the Garrett is such a valuable company in metal detector field. All of Garrett's detectors are extreme that you have to try hard to break any of their detectors. Their products can be used in overseas in rough environments, jungles and even in some military operations. Each and every Garrett product are so effective that people can relet with their products. They always use advanced technology and great features to attract the user. That's why people love them so much and appreciate them by using their machines. This company is so great that we couldn’t stop yourself to give you the Garrett metal detector review. So let’s get into the reviews. Garrett ace 250 deals with more services in a range of budget. The new Target ID function, three tone audio system, better detection abilities and also better environmental cover-up than other devices of Garret. The Garrett ACE 250 detector is a very light weighted device. SO, more extended hunting will make more comfortable with this fantastic device, and the best part is this device is mainly a beginner's device with a comfortable and user-friendly interface. It doesn't matter you are a beginner in the hunting field instead you should get this machine to make yourself comfortable and be professional in this quarter. The most important feature of this detector is the digital Target ID identification. This tech increases the effectiveness of this device and also make the hunting stress less. By adding this feature to these 250 series, the ability of the device is improved very much, and also it makes hunting comfortable. The adjustable frequency option helps to avoid interference which makes the hunting more efficient. The 3-tone audio output system makes it easy to detect materials of various kinds of metals. This feature may be suitable for beginners so that they can hunt easily with fun. ​Garrett ace 250 knows what you desire to seek. The notch discrimination option allows you to pick up the materials and rush for hunting. The device also contains 12 discrimination controls. ​The push button type control pad contains all the modes and setup which can be accessed very quickly by the beginners. Besides this simple interface system is also power saving. The devices consist of eight sensitivity and depth adjustable mode for more compatibility. The ground balance is factory stetted so that it makes the device friendlier to use at hunting. ​It has provided standard pinpoint along with digital electrical pinpoint mode. Along with pinpoint mode, these 250 series contain PWR mode which makes it more efficient and power saving device. ​The new extra feature Cam locks are included for increasing steam stability. This stability mode allows hunting faster which is easy for the beginners and also time efficient. The device is graphic target ID cursor enabled so that it will be more fun to hunt with it. It provides three levels of audio signals. Adjustable length makes it more comfortable to use for several types of people. ​The weight of this machine is only 2.7lbs. ​It consumes extremely low power of only 4-AA batteries. ​Preset ground balance option is included for hurry rushes. Continuous target depth sensor is included with it. ​It has come with two years of warranty. ​The ace 250 is an outstanding all-around metal detector. It can be practiced to hunt old coins, jewelry, relics, artifacts, buried treasure, and other valuables. The ace 250 also uses interchangeable AC research coils. Slightly high budget device for beginners. The Garrett ace 250 is a compressed and s uitable detector for virtually any kind of conditions. This detectors waterproof technology makes it more versatile for use. Beginners can start their hunting carrier with this device and get extra comfort zone of by its light weighted and other functional properties. So it will be an exceptional choice if you select this product for hunting treasures. Go and rush for the treasure. Ace 300i detector offer great depths, rugged design and performance at a price and only Garrett can offer. It's no surprise that the Ace has become one of the world's most popular metal detectors. The Garrett ace 300i a very economical detector with powerful features to help you find more coins, jewelry, and artifacts. The Ace 300i includes digital target ID with the large 0 to 99 scale for more target information and 8-kilohertz frequency for improved sensitivity on low and medium conductivity targets like gold and lead. A new 7 inch by 10-inch concentric search coil offering excellent coverage and depth and adjustable frequency to help eliminate electrical interference or other detectors and competition hunts. Assembly of your new ace detector is very simple. The ACE 300i includes three free accessories. Garret volume control headphones, an environmental cover-up to protect the control box from rain, dust and mud and a coil cover to protect your search coil from scratches and chips during use. The Garrett Ace 300i also has electronic pinpointing select all-metal, jewelry, custom relics, coins or pinpoint. These five search modes enable the option where you can select preset discrimination patterns or create your own. ​When your battery level indicator shows one bar remaining it's time to change batteries. Nickel metal hydride rechargeable batteries can be used, but they may have a shorter life per charge than standard alkaline batteries. 1.5-volt lithium batteries can also be used but 3.7-volt seven-volt lithium batteries will damage the detector and should not be used. ​Cam locks for increased stem stability and a sharp, responsive pulse width modulation audio. ​Notch discrimination mode to modify discrimination patterns and continuous coin depth indicator to determine target depth. Electronic pinpointing option to precisely locate target and speed recovery. The ace 300i also includes this battery level indicator when it's down to only one bar remaining it's time to change your batteries soon. ​Ace 300i is always going to indicate all targets that it encounters in the field. ​The ace 300i makes three distinctive tones based on the conductivity of the metal. ​It has also come with an expanded target ID legend above the large easy-to-read LCD screen to see what you are searching. It takes some time before the hunters can know what the beep sounds are all about. You would never imagine a detector with this price tag to offer so much greatness — just one more reason you need the Garrett Ace 300i metal detector. So hold on tight the Ace 300i will take you on a treasure hunting adventure of your life. This is the Garrett ace 400i which is ideally suited for finding foreign coins, jewelry, and artifacts. The Ace 400i includes iron audio to help identify discriminated iron targets digital, target ID with a large 0 to 99 scale for more target information, a 10 kilohertz frequency for improved sensitivity on low and medium conductivity targets like gold and lead and adjustable frequency to help eliminate electrical interference or other detectors and competition hunts. Cam locks for increased stem stability and a sharp, responsive pulse width modulation Audio. The ace 400i has three distinctive tones based on the type of metal that you encounter and its conductivity. The low tone on the ACE 400i is anything with a digital target ID reading between 0 & 39, mid-tone is going to be anything between 40 and 59 on your Digital target ID and the high tone that's anything that reads above 60 on your digital target ID. One of the powerful features included on this ace 400i is iron audio now what that does it helps you avoid digging tricky items like washers and bottle caps flat items that might sound good to a detector, but they contain iron, so the use of iron audio can help you pick that out. ​Nickel metal hydride rechargeable batteries can be used, but they may have a shorter life per charge than standard alkaline batteries. 1.5-volt lithium batteries can also be used but three-point seven-volt lithium batteries will damage the detector and should not be used. ​Your ace 400i is always going to indicate all targets that you encounter in the field. In this way, you get more information coming back to you from the machine, and you can decide whether or not to dig a target. It saves a lot of time, and it's a sophisticated feature. The ACE 400i has five factory preset modes, and it also has a custom mode that you can pre-program and you can notch in or notch out undesirable or desirable targets as you feel. This way you can suit the machine you can program the device to the relic or coin area that you're hunting to suit the environment. The significant new feature on these ice machines is the digital target ID. Similar like the AT gold and the AT pro and you can get a digital reading from 0 to 99 of the conductivity of the target you've detected. The ace 400i also includes this battery level indicator when it's down to one bar remaining it's time to change your batteries. ​Digital target ID allows you to discriminate iron from gold and lead from bronze and copper and silver. ​The ace 400i is one of the best professional level relic, coin, and jewelry detector. It comes with a large double D coil which allows you to go into quite mineralized soils. Included headphones are not up to the mark. The ace 400i includes three free accessories Garrett volume control headphones, an environmental cover-up to protect the control box from rain dust and mud and the coil cover to protect your search coil from scratches and chips during use. Assembly of your new ace detector is very simple. So it can be a perfect detector for you. Garrett GTI 2500 pro is a detector which incorporates more than a quarter century with an innovative metal detection technology. The GTI 2500 is Garrett's top the line metal detector. The reason why is there's some features in this machine that other detectors do not have they are exclusive to Garrett. It shows you not only what it says is in the ground before you dig it also gives you an idea the depth of the target and even the size of the goal whether it is coin size smaller than coin larger than coin it gives you all this information right on the screen - starting with one-touch treasure hunting. This metal detector comes with two different search coils. With a touch of a button, your detector is powered on automatically reset the factory settings or your settings automatically adjusted for ground minerals, and you're ready to search. The GTI has a powerful single frequency detection. With a single frequency detector, you get one extremely powerful frequency that's engineered to search deeper and find more treasure in the most common soils. It has come with a nine and a half inch search coil here. It is submersible and waterproof, the machine has a very nice layout for the display, and it is the most massive display of any metal detector made. ​Garrett's exclusive power master circuitry boosts detection depth by 20%. For the old deeply buried treasures and relics, the GTI 2500 can be upgraded to a specialized coil called the Garrett treasure hound and eagle-eyed depth multiplier. ​Eagle Eye is a specialized coil system capable of detecting large metal objects at depths much more significant than most standard search coils so can find treasure at depths no other detector can reach. The patented Eagle Eye pinpointing search coil identifies the precise location of a detected target. ​They are backed by a powerful onboard digital signal processor or DSP chip. The GTI 2500 unique benefits can't be beaten. The GTI 2500 brings graphic imaging to the hunt if not only signals that you hit a metal target it notifies you the size and the depth of that target and what the target probably is. By using the treasure vision screen, you can find out what you've located a coin a pull tab a drink can or something more significant that way you decide whether you want to dig it up. You can switch from two coils searching to conventional pinpoint load with a touch of a button this is the metal detector the pros use to find the best treasure. From the graphic identification of targets to unique depth capabilities and hunting versatility the GTI 2500 metal detector does it all. ​It has both the 9.5 inches and the 12.5 inches imaging search coils. You can search for treasure at depths greater than you've ever imagined. ​It also features a hip mountable battery pack, so this reduces approximately a pound off of the weight of the machine. The Garrett GTI 2500 the screen itself is the largest on any metal detector made, and the treasure vision imaging feature is exclusive to Garrett GTI. ​It has come with six operation search modes Waterproof Touchpad and multiple Add-ons. GTI 2500 has two Years of Manufacturer’s Warranty. It is a little bit heavy than similar metal detectors. Make sure you're finding the right treasure the right way with the Garrett GTI 2500 Pro. It is probably the best metal detector for any kind of ground at any moment. This is the best of the AT Pro in the AT gold combined and much much more of what our customers have been asking for. The AT max includes built-in Z-lynk wireless technology and a pair of new Garrett ms3 wireless headphones with near-zero delay the integrated Z-lynk system operates six times faster than Bluetooth speed. This means you hear your target signal while the search coil is directly over the target no delay: maximum freedom, auto pairing, no cords, no cables and no interference with other wireless devices. It is one of the best Garrett metal detector. Increased transmit power and enhanced electronics provide the AT max with a significant depth increase. This detector also includes a true all-metal mode and an optimized frequency of 13.6 Kilohertz. Providing excellent detection on a wide range of targets including silver coins, jewelry, and brass relics. The AT max is also sensitive enough to pick up small gold nuggets, and this machine cost is like The Garrett at gold metal detector best price and Garrett AT Pro international best price. The AT max can be automatically or manually ground balanced with 175 points of balanced ground resolution. This allows the machine to efficiently handle both conductive soil like saltwater beaches and highly mineralized ground. Garrett's exclusive automatic ground balance window feature means the AT max can concurrently ground balance to a mountain of values to help overcome localized ground variations to smooth detector audio and allow you to hear faint targets. ​The AT max also includes iron audio to help avoid digging trashing undesired flat iron items. All metal iron audio a Garrett exclusive features to audibly identify discriminated iron while operating in a true all metal mode. ​This thing this detector is designed for use in both saltwater and freshwater. The AT max can be used wirelessly to hunt streams or shallow water as a Garrett all-terrain detector. The AT max can be fully submerged to 10 feet or 3 meters. ​With the AT max, you can take advantage of built-in Z-lynk technology along with the MS 3 Z-lynk wireless headphones that are included. This is a tremendous value for a wireless machine that can also be used to hunt fully submerged. The AT Max include proportional pulse width modulation audio response which provides more target information and sharp, responsive target signals. With the AT max, you have for search modes to choose from — a true all metal mode, custom mode, coins mode, and zero discrimination. The AT max includes a backlight for improved visibility and low-light situations. Larger display numbers including the digital target ID and the iron discrimination numbers. ​A more robust non-absorbent, textured grip and adjustable threshold allowing you to modify the constant background hum to hear faint target better. ​Adjustable frequency and minor frequency shifts help to eliminate interference and Notch discrimination and 44 points of high-resolution iron discrimination. Also included with each AT Max is a free search coil cover and for a limited time during its introduction. ​Powerful, Wireless, all-terrain performance the AT max is built for the professional treasure hunter. It is a little bit expensive. The US version of the AT max includes the coins mode and tone ID breakpoints appropriate for US coins. Outside of the United States, Garrett will offer the AT max international. The international version includes the coins mode and tone ID break points appropriate for international coins as well as a different target ID legend and a metric depth scale. Of course the AT max detector you can also expect fast recovery speed and excellent target separation which means more coins and relics in your dig pouch. Finally we have the Garrett ATX review. The Garrett ATX is the gold detection device that combines high-end performance with mid-range price in one package. With it’s specifically for the gold nuggets hunting like excellent ground balance and enhanced pulse induction technology with extreme sensitivity to detect the smallest gold grains. The new Garrett ATX is the gold detector for all terrains and extreme conditions such as highly mineralized ground and saltwater. Featuring advanced pulse induction technology and an innovative new double D coil design the ATX detects tiny gold nuggets that other pulse machines can't. Plus there's no need to switch modes to enhance detection of one target while degrading another. The ATX provides the maximum number of detection on all targets all the time. 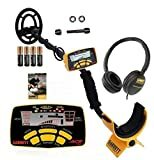 This metal detector review also based on Garrett at gold metal detectorreview because it is a high-performance gold detector. The ATX has supreme detection on all targets all the time. No need to switch modes or switch search coils to enhance detection on small gold while degrading detection of larger nuggets. The ATX has both motion and non-motion modes plus an LED signal indicator to show the strength of the target response. ​Its excellent ground balance will handle all conditions from the ironstone ground to salt water without the need to switch modes, and there's even a quick iron check feature to identify iron targets. ​It can also be operated with its stem fully extended fully collapsed or anywhere in between. The search coil can also be locked at a 90-degree orientation to scan embankments or walls. And the search coil can be quickly rotated into other orientations to scan embankments or walls. ​The ATX will go anywhere from mineralized mountaintops to ten feet underwater expand your search options with one of The ATX's optional search coils such as the 20-inch mono coil which is ideal for hunting caches and other deep targets. The ATX includes land use headphones, alkaline and rechargeable batteries, a battery charger, a carrying bag, and a detector sling. You could pay an ultimate price two or three times more and still not get the extreme capabilities and features of the ATX. With Garrett, there's no extreme pricing just extreme performance. ​The Garrett ATX has advanced pulse induction and the new double D coil design. It is considered to be the optimum technology for deep signal penetration. With this combination, you get extreme and uniform sensitivity to gold of all sizes. This allows for superior ground cancellation and enhances this detection of short items without having to slow down the scanning speed of search coil. ​The ATX is ideal for hunting on land for gold prospecting and relic hunting and highly mineralized soils. It has a robust, strong design that meets military specifications making it perfect for the beach and shallow water coin and jewelry hunting. Advanced ground balance with a wide range from heavily mineralized ground to saltwater without switching to particular modes. The new design of waterproof search coil to enhance detection of the smallest nuggets. ​Motion and Non-motion modes for optimum performance based on your hunting preference and conditions. ​LED indicators to show the signal strength and current device settings. ​Volume control adjustment to limit the response of large signals in order to hear deep and faint signals better. Built-in waterproof speaker to search without headphone. ​The detector comes with a two-year Garrett warranty. ​ATX advanced modes include both motion and non-motion, LED signal strength indicator, iron check and much more. The ATX can be operated with its stems fully extended, fully collapsed or anywhere in between. Single push-button controls at your fingertips allow one-hand operation no second hand needed to make adjustments. Waterproof headphones are not up to the mark. The detector is quite heavy. 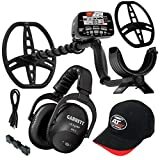 The Garrett ATX extreme pulse induction metal detector is a fantastic ATX detector that is the first example of what a multi-frequency detector should be. This is also the ultimate gold detector for all terrains and extreme conditions, so it is a profitable investment for prospectors. The ATX is ruggedly designed to military specifications, all coil cables and electronics are protected within its sturdy housing so if you are a professional hunter than it could be the ultimate detector for you. Okay! We are at the end of our Garrett metal detectors review. The Garrett is the best in business on multiple sectors, including the heavy hitting. They price al of their metal detectors and associated accessories at a value rate, and more importantly, they ensure the quality of products that are sold. We hope this article provides you with enough information to choose the best Garrett detector by this Garrett metal detectors review. Toolguider.com is a participant in the Amazon Services LLC Associates Program, an affiliate advertising program designed to provide a means for sites to earn advertising fees by advertising and linking to Amazon.com. Amazon, the Amazon logo, AmazonSupply, and the AmazonSupply logo are trademarks of Amazon.com, Inc. or its affiliates.